Preheat oven to 350. Bring a large pot of water to a boil, generously season the water with salt. Add the pasta and cook until al dente. Strain and set aside. Add panko to a small prep bowl with one part of the parmesan cheese. Add in melted better and toss to combine, set aside. While pasta is cooking, start on the béchamel sauce. Melt butter in a small pot over medium heat. Whisk in flour and cook for 1-2 minutes, allowing the floury flavor to cook out. Add milk and bring sauce to a bubble. Reduce and stir the sauce in a figure eight motion until it becomes rich and creamy; about 5 minutes. In a large prep bowl, add cooked pasta. Pour marinara over the pasta and gently fold to coat. Pour in the béchamel and ½ of each of the cheeses. Gently fold the béchamel and cheese to combine. 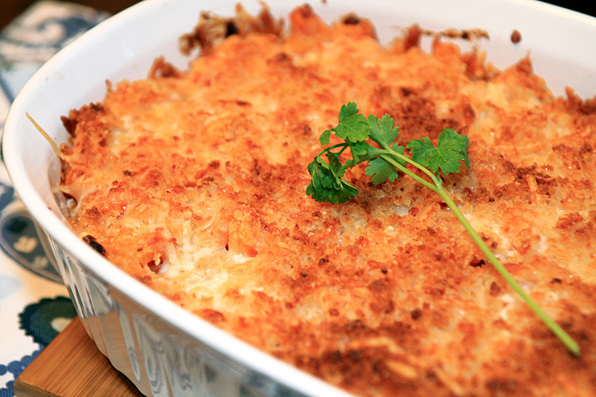 Transfer pasta to a casserole dish and cover the top with the remaining cheeses. Finish by sprinkling the cheese with the buttered panko/parmesan mixture. Place the casserole in the oven for about 20 minutes. Change the setting to broil and continue to cook until brown and bubbly; 3 to 5 minutes. Remove from the oven and allow to cool for about 5 minutes before serving. This recipe freezes beautifully. Freeze leftovers and reheat in the oven at 350, covered with foil, for about 15 minutes.